After my guild's first Bottles of Hope newscast aired, we had several calls from folks requesting bottles. One of them was a cancer survivor who felt like she had been given a miracle cure from the angels. I made this angel bottle for her. I covered a 2" glass bottle (finished height is about 2.75". I used Premo brand clay in pearl, beige and copper. 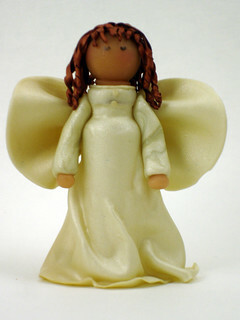 I also used instructions from Maureen Carlson's "How to Make Clay Characters" to help me make her curly hair.